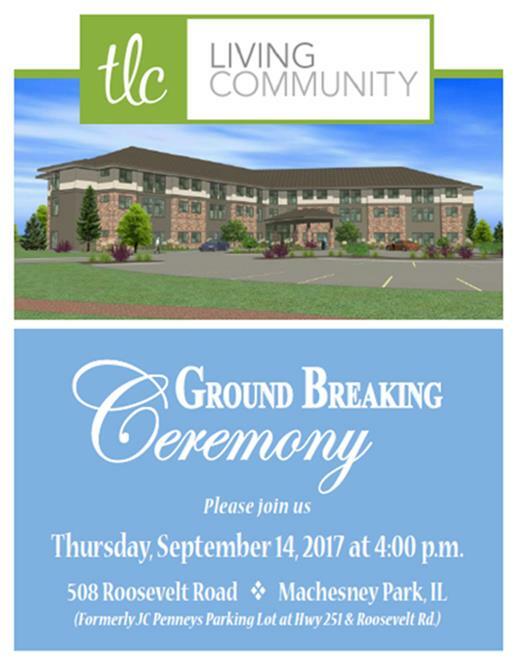 You are invited to attend the Ground Breaking Ceremony for the TLC Living Community Assisted Living Project on Thursday, September 14th, from 4:00p – 5:00p. This 60-unit assisted living development is the product of a public-private partnership that will serve as a catalyst for the redevelopment of the Machesney Town Center (former Machesney Park Mall). TLC representatives, Dignitaries, and Staff will be on-site for the ceremonial ground breaking and will provide brief statements regarding the project. A map illustrating the general location of the ground breaking event can be viewed here: https://goo.gl/maps/GmUMaP9cnTT2. Attendees and speakers will gather at the tent/podium that will be in place on-site. We look forward to seeing you there!